Surely there will be a calm, rational, well reasoned response to this story. 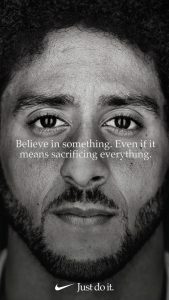 Nike revealed, through ESPN’s Darren Rovell, that it is making Colin Kaepernick the face of its “Just Do It” 30th anniversary ad campaign. The NFL season will start Thursday, and Kaepernick remains unsigned. That whole story makes the Kaepernick-Nike alliance a bit more interesting. Kaepernick recently won the summary judgment phase of his collusion case against the NFL, which indicated arbitrator Stephen Burbank felt there enough merit in the arguments and evidence produced by Kaepernick’s lawyers to warrant a trial in the case. It was a loss for the NFL, which has claimed there was no collusion to keep Kaepernick out of the league, although dozens of less-qualified quarterbacks have signed with teams since Kaepernick took a knee during the national anthem to bring attention to social issues. Nike is a corporate sponsor with the NFL. They provide the official jerseys for the league that Kaepernick is trying to beat in a collusion case.